Fully self contained 1 bedroom apartment with Queen size bed, CONTINENTAL BREAKFAST INCLUDED Set in tropical surrounds ,overlooking Pool & BBQ area. Maximum occupancy is 3 people.$22 extra per adult & $11 extra per child. All apartments are luxurious appointed and fully self contained, including Air-Conditioning and Ceiling Fans in all rooms for maximum cooling and environment efficiency. Our Luxury One Bedroom Apartments overlook the lush tropical landscaped gardens and the Lagoon Style Swimming Pool & Wellness Spa. The relaxing sound of running water and the feng shui decor and environment forms a relaxed ambience enabling you relax rejuvenate your body mind and spirit. Each Apartment has a fully equipped gourmet kitchen including Blanco Oven & Bench Plates, Dishwasher, Fridge/Freezer, fully equipped laundry facilities including Washing Machine, Clothes Dryer, Iron & Ironing Board. Each ensuite has a bath, shower & a modern vanity basin with stone tiled feature, concealed toilet and Hair dryer included. One Bedroom Apartments, comprise of a Large King bed (or King Singles can be provided on demand), separate living/dining area and fully equipped gourmet kitchen. Apartments have a TV, DVD, Hi-Fi, CD player and radio. A broad range of DVD's are available for hire. 1 bedroom apartment with Queen size bed in master bedroom, ensuite bathroom, lounge/dining area, kitchen facilities comprising of fridge/freezer, microwave and hot plate, private balcony or patio, airconditioning and ceiling fans and washing machine, dryer, iron and ironing board. A third guest can be accommodated on a rollaway bed for an additional $30 per night. Modern, well appointed apartments offering one Queen bedroom, separate kitchen and living area, bathroom with laundry facilities. Private Balcony. Kitchen includes dishwasher, stove top, oven, microwave and full fridge. Apartments are suitable for up to 2 Adults (& baby in cot). All apartments are fitted with a full kitchen with a microwave, stove, refrigerator and dishwasher, as well as a phone, two bathrooms, and a washer and dryer. Each room also has a private balcony or patio with a view of the Beach and water. BEST VALUE FOR MONEY SPECIAL!!! The 1 bedroom apartment is clean, spacious, well maintained, self contained, well appointed and fully equipped, offering generous open-plan living, large picture windows and a large private balcony or patio - just the place for relaxing with a cool drink and a good book, savoring the tranquillity and enjoying the view of the garden and sea breezes. The 1 bedroom apartment comprises a seperate master bedroom with 1 Queen bed, a private bathroom with SPA BATH and shower, a full kitchen with microwave, stove, oven, large refrigerator/freezer and dishwasher, air conditioning, ceiling fans, insect screens, 2 TVs, Austar cable TV, CD / radio / music system, video / DVD player, wireless broadband internet access, telephone - ISD / OTTC / voicemail / data jack, own laundry with washing machine, clothes line/airer & clothes dryer, alarm clock, radio, hairdryer, all linen, iron/ironing board, picnic set and esky cooler (chilli bin) - great for going to the beach. The apartment is are serviced weekly or on request. The rate is for 2 guests. Maximum 2 guests. New property only 100 meters to town!! 1 bedroom fully self contained apartment, comprising 1 King/Queen bed or 2 Single Beds (please specify preference when booking), full kitchen with European Blanco appliances and granite bench tops to kitchen and vanities, living area that leads to large pool facing balcony, laundry facilities, DVD/CD, cable TV and wireless internet. Located on levels 1 or 2. Rates are for 2 people. The room caters for a maximum of 2 adults. New property only 100 meters to town!! Deluxe 1 bedroom fully self contained apartment, comprising 1 King/Queen bed, spa bath, full kitchen with European Blanco appliances and granite bench tops to kitchen and vanities, laundry facilities, living area leading to balcony with large jacuzzi. DVD/CD, cable TV and wireless internet. Rates are for 2 people. The room caters for a maximum of 2 adults. New property only 100 meters to town!! Large fully self contained 1 bedroom apartment with private Jacuzzi on balcony OR direct pool access. Nil guarantee. The Superior Apartment also comprises 1 King/ Queen size bed, which can be twinned (if required, please specify when booking), full kitchen with European Blanco appliances and granite bench tops to kitchen and vanities, laundry facilities, DVD/CD, cable TV and wireless internet. Rates are for 2 people. The room caters for a maximum of 2 adults. ONLY 10 SECONDS TO THE BEAUTIFUL SANDY BEACH!! GREAT POSITION! The One Bedroom Apartment is spacious, clean and airy with lots of natural light and is fully self contained, featuring a spacious private furnished balcony with sunlounge and views over our spa & pool area with the mountains as a stunning backdrop, either 1 King bed or 2 Single Beds in the seperate bedroom ( please specify preference in the Special Requests Section of your booking) with its own TV, modern designer fittings,full air conditioning with temperature control and screens, designer kitchen with granite benchtops and stainless steel appliances including dishwasher and full size refrigerator, a luxurious private bathroom with shower, very spacious living area, desk, a second colour TV, satellite/cable TV, telephone with data port, voicemail, private laundry with washing machine, clothes line/airer, iron/ironing board and clothes dryer, ceramic floor tiles in all living areas, wireless broadband, music system, DVD player, CD player, Wii game console, ceiling fans, alarm clock, hairdryer, safe and radio. The rate is for 2 guests. Maximum occupancy is 2 guests. BEST VALUE FOR MONEY! An easy 2 minute walk to choice of 7 Restaurants and new Trinity Beach Tavern with Meals and Gaming room. ONLY 10 SECONDS TO THE BEAUTIFUL SANDY BEACH!! GREAT POSITION! The One Bedroom Beachfront Apartment is spacious, clean and airy with lots of natural light and is fully self contained, featuring a spacious private furnished balcony with sunlounge and spectacular beach/oceanviews, either 1 King bed or 2 Single Beds in the seperate bedroom ( please specify preference in the Special Requests Section of your booking) with its own TV, modern designer fittings,full air conditioning with temperature control and screens, designer kitchen with granite benchtops and stainless steel appliances including dishwasher and full size refrigerator, a luxurious private bathroom with shower, very spacious living area, desk, a big screen colour TV, satellite/cable TV, telephone with data port, voicemail, private laundry with washing machine, clothes line/airer, iron/ironing board and clothes dryer, ceramic floor tiles in all living areas, wireless broadband, music system, DVD player, CD player, Wii game console, ceiling fans, alarm clock, hairdryer, safe and radio. The rate is for 2 guests. Maximum occupancy is 2 guests. BEST VALUE FOR MONEY! An easy 2 minute walk to choice of 7 Restaurants and new Trinity Beach Tavern with Meals and Gaming room. Only a short stroll to the beach, restaurants and cafes, Palms at Trinity is located off the main road, offering quiet relaxed surroundings for an enjoyable holiday. The 1 bedroom apartment features a balcony/courtyard with views of the swimming pool/tropical gardens and comprises 1 bedroom with a Queen size bed, a private ensuite bathroom with shower over bath, seperate lounge room, a fully equipped kitchen with full size refrigerator, private laundry facilities including washing machine, dryer, clothes line/airer and iron & ironing board, air conditioning, ceiling fans, alarm clock, broadband, DVD player, radio, colour TV and Wireless / WiFi. Rates are for 2 guests. maximum 3 guests. Extra guest charge $19.00 per night. This fully self-contained spacious, luxury one bedroom apartment features a fully equipped kitchen, laundry( with washer and dryer), lounge/dining room, balcony, bedroom with either 1 Queen bed or 2 single beds( please specify your preference when booking. The apartment rates are for 2 people. Maximum occupancy 4. Extra guest charge applies. 1 bedroom Port Douglas apartments with a Queen Bed, 1 Bathroom, Air-conditioned Lounge, Balcony, Bath, Dryer, DVD Player, Freezer, Fridge, Hair Dryer, Internet Access, Iron/Ironing Board, Kitchen, Linen Provided, Microwave, Outdoor Furniture, Oven, Telephones, Television Lounge, Video Player and Qashing Machine. (Minimum 3 nights stay) One Bedroom Apartments include full kitchen, private laundry and spacious living areas. Excellent value the 1 bedroom apartment has separate bedroom with 1 queen bed and ensuite bathroom. An extra roll away bed can be added for the extra guest at additional cost. It also contains separate lounge dining with a full kitchen and a choice of pool and city views. The rooms include: split system Air Conditioning, large balcony, designer kitchen appliances, stove and microwave, toaster, kettle, crockery and cutlery, dining table and chairs, sofa and lounge, tea and coffee making facilities, washing machine and dryer, fridge, ironing board, direct dialling phone, ceiling fans, WI FI, hair dryer, SPA tub for 2, DVD and VCR player, 6 channels of Austar cable TV available at an extra charge. Non smoking hotel. Guests included is 2. Maximum number of guest 3. Extra guest charge $30 a night. Spacious 1 Bedroom Apartment to create the homely feel while on your trip away. Great Esplanade Location only minutes walk to the CBD. With varying views of the surrounding city and Coral Sea, these rooms consist of either 1 Queen bed or 2 Double beds and are located in either the Apartment or Studio Complex within walking distance to the CBD. These Hotel Style rooms are not serviced daily. Rate is for 1-2 Guests 1B/1B Apt.Full Kitchen & Laundry Facilities in every apt. FREE Cable TV FREE Undercover Secure Parking.Full Tour Desk. Resort Style Pool & Heated Spa with Fantastic Views overlooking the Esplanade. Min 4 nights stay. One bedroom apartment with Double or Twin bedding, a washing machine and dryer, colour television, direct dial telephones, air-conditioning, ceiling fans,i ron & Ironing board and a fully equipped kitchen. One bedroom, air conditioned, fully furnished unit either on the ground level or one level up. Upper level has balcony. Queen size bed with fold out lounge suite for extra guests if required. Full laundry facilities in bathroom. If one bedroom unit is not available, a two bedroom unit may be used at the same rate. All units contain a full kitchen with utensils; lounge suite;TV, dining table and chairs in the living area. 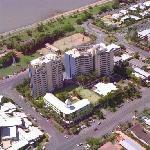 Fully furnished 1 bedroom Cairns apartments that are an average 60 square metres in size. The apartments feature a private balcony, Queen size bed (additional single bed available), air-conditioning and ceiling fans, Colour TV, telephone, Fully equipped kitchen with dishwasher, oven, microwave and fridge, hair dryer and private laundry facilities. Spoil yourself with a little bit of luxury in this one bedroom apartment. All apartments contain spacious living area with airconditioning, tv, dvd & austar, fully appointed kitchen with oven, separate bedroom with King Bed (or 2 singles) and ensuite and a spacious private balcony. Broadband Internet is also available. In Central Cairns CBD - 2 persons, max 4. Extra guest $20 p/n. One BR, Self Contained Apts (own balcony). Full Kitchen, Laundry, Bath/Shower, Wireless Internet, Austar, Pool, BBQ, Tour Desk, Free Gym, and Secure (Undercover) Parking. Spacious 1 bedroom apartment with king size bed, walk-in robe & ensuite. Fully equipped kitchen & laundry. Air-conditioned with fans & screens. Pay TV, DVD, Stereo & wireless internet. Large private balcony. One bedroom fully self contained apartment with queen bedding, ensuite bathroom with shower and bath, full kitchen facilities including stove, microwave and fridge/freezer, living/dining area and private balcony. These 1 bedroom Palm Cove apartments are fully self contained with their own private courtyard, fully euqipped kitchen, air-conditioning and your own ground floor garage. Fully self contained 1 bedroom Palm Cove apartments complete with its own private swimming pool, a private courtyard / patio area, fully euqipped kitchen, air-conditioning and free secure car parking. Our AAA Tourism 4 Star rated one bedroom apartments which have recently been refurbished are fully self contained. Rates quoted are based on two person twin share.